As shown in the beginning of this chapter, the appropriate use of technology can reduce and. in many cases, totally eliminate customer waiting time. Automated teller machines (A'I'Ms) now provide bank customers with 7 x 24-hour service. eliminating th need for customers to wait until the bank opens in the morning. Customers with personal computers can access their accounts via the Internet at any time, day or night. and request certain transactions to take place. (See OM in Practice box on ATMs. )Bar-code scanners at checkout counters in department store and supermarkets reduce service processing times and also customer waiting times. Similar types of scanners are now being used on toll roads where commuters can obtain a "bar code" for their cars that is then electronically scanned each time the car passes a toll booth. On the i\1assachusetts Turnpike. for example. a toll booth in the Fast Lane. which uses bar-coded technology, has more than twice the capacity as a regular toll booth with a person collecting the money. (The Fast Lane toll bo th processes more than 1.000 cars an hour versus .f50 cars an hour for the regular: II booth.) (Currently under Dev elopement for use in -supermarkets are scanners that ill be able to scan an entire shopping C:.lI ing to unload it.) Bar-code scanners are similarly used at many airports to -can tickets as passengers board airplanes. This permits passengers to board more quickly and with less waiting time.At the same time, it provides the airline with a list of those passengers-, ho art! onboard. In. providing faster service, however, managers should not lose sight of the fact that it is the customer's perception of the wait that is critical. rather than the actual wait itself. There are many factors that can affect customer perceptions of waits, and the service manager needs to know what these factors are and which of them can be effectively managed by the firm. Sun an approach will provide a proper framework for the allocation of a firm's scarce resources to ensure both faster and more efficient service. 1. 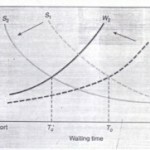 Explain the analogy between having inventory in a manufacturing company and having customers waiting in line in a service operation. 2. What are some of the factors that you think might affect your degree of satisfaction with waiting in line in a supermarket checkout line late at night? ... in a bank during. your lunch hour? ... at a fast-food restaurant with young children (not necessarily your ownl)? 3. Calculate the opportunity cost associated with a dissatisfied customer who stops frequenting a fast-food restaurant for a year. What are your assumptions? 5. From your own personal experiences, cite some actual examples of both good and bad waiting line management practices. Bibliograph Bearden, W.O., and J. E. Teele. "Selected Determinants of Consumer Satisfaction and Complaint Reports,"
Journal of Marketing Research 20 (February 1983). Chase, Richard B. "The Ten Commandments of Service System Management." interface 15, no. 3 (May-June 1985). Churchill. G. A. Jr .. and C. Surprenant. "Investigation into the of Marketing Research 19 (November 1982). Davis, Mark M., and Janelle Heineke. "How Disconfirmation. Perception and Actual Waiting Times Impact Customer Satisfaction." International Journal of Service Industry Management 9, no. I. 1998, pp. 64-73"Understanding the Roles of the Customer and the Operation for Better Queue Management." International Journal of Operations and Production J!a!l(I~emen! 14. no. 5 19(4), pp. 21-34.